The American flag is immediately recognisable and is the most famous of all the American symbols. It is also referred to as the Stars and Stripes, Old Glory, Red, White and Blue and the Star Spangled Banner. The flag serves as a symbol of honor, heritage and national pride and is displayed at all state buildings and many residential houses especially on holidays like Veterans Day, Presidents Day, Memorial Day and on Independence Day, 4th July. The American flag has 13 stripes that represent the 13 original colonies and it also displays 50 stars representing the 50 states. Fact 2: The American Flag came into being on June 14, 1777. What is the design of the American flag? 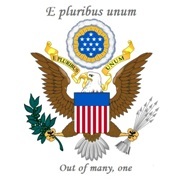 The canton on the American Flag is specifically referred to as the "union"
The thirteen equal horizontal stripes are displayed as red at the top and bottom with alternating red and white stripes between. What is the common decoration of the American flag? A golden fringe surrounding the perimeter of the American flag. According to ancient heraldry a pattern of horizontal (barwise) stripes, in different colors, is called a 'Barry'. The precise colors of red, white, and blue used in the American flag are specified with reference to the Color Association of the United States (CAUS). 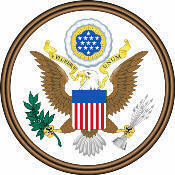 The colors are specifically referred to as "Old Glory Red", "White" and "Old Glory Blue". What do the colors mean, or symbolize, in heraldry? Charles Thompson, Secretary of the Continental Congress, described the symbolism of the colors as "White signifies purity and innocence, Red, hardiness & valour, and Blue, signifies vigilance, perseverance & justice." George Washington (1732-1799) explained the symbolism of the colors of the 'Union Flag' as follows: "We take the stars from Heaven, the red from out mother country, separating it by white stripes, thus showing that we have separated from her, and the white stripes shall go down to posterity representing liberty." What is the shape and American flag ratio? The 'Hoist' is the width and the 'Fly' is the length. The ratio is 1:5 meaning it is 1 unit tall for every 5 units wide. Size 2 × 3 ft. or 4 × 6 ft. 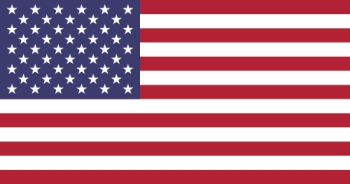 The man credited with designing the current American flag in 1958 is Robert Heft. His updated design featured 50 stars. His work was part of a class project which was adopted by presidential proclamation after Alaska, and before Hawaii, was admitted to the union in 1959. What is the history of the American Flag? 1776 May: Betsy Ross reported that "she sewed the first American flag"
1777, June 14: The Marine Committee of the Second Continental Congress passed a resolution establishing a new design: "Resolved, That the flag of the thirteen United States be thirteen stripes, alternate red and white; that the union be thirteen stars, white in a blue field, representing a new constellation." 1949 August 3: American Flag Day (June 14) observance each year by proclamation. What is the American Pledge of Allegiance and Salute? The American Flag is kept and used as required by the code specified in the Constitution of the United States. The Old American flags play an important role in the history and development of the American flag. Recommended reading: Star Spangled Stars History. 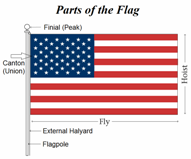 The sizes, specification and dimensions of the American Flag are detailed below and ensures that the stars and stripes are all correctly proportioned. These sizes and specifications are contained in Executive Order No. 10798 of January 3, 1959, which, strictly speaking, governs only flags made for or by the American government. However, many American national flags on general sale have a different length-to-width ratios. The most common sizes are 2 × 3 ft. or 4 × 6 ft. (flag ratio 1.5), 2.5 × 4 ft. or 5 × 8 ft. (ratio 1.6), or 3 × 5 ft. or 6 × 10 ft. (ratio 1.667).